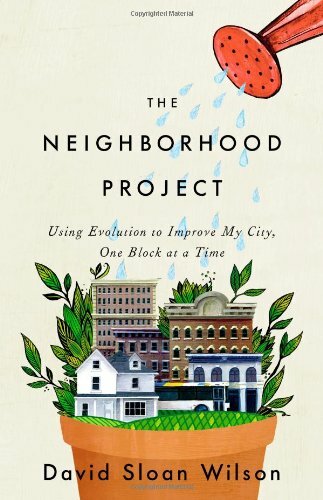 The Neighborhood Project: Using evolution to improve my city, one block at a time. David Sloan Wilson. New York: Little, Brown, and Company, 2011. David Sloan Wilson has played a major role over the past thirty years or so in reclaiming the science of evolution from the grips of individualism, the theory of the "selfish gene" being the most well known expression of that interpretation. Along with more than a few others he helped to re-establish the central importance of group selection and cooperation. As with Elinor Ostrom and her Workshop, this piece of work goes hand-in-hand with an explosion of work throughout the social sciences exploring empathy, cooperation, and the major role that small groups play in human life. For some time now, Wilson has focused on demonstrating that evolutionary thinking is an eminently practical way of thinking about everyday life and the legions of problems and dilemmas we struggle with. Five years ago he began to walk his talk at the grassroots level by starting the Binghamton Neighborhood Project (BNP). (He teaches at the State University of New York in Binghamton, NY.) Through this project he is testing out ways to re-think social change from the ground-up through the lens of evolutionary theory and the application of evolutionary research methods. That is, he combines a very large way of thinking with gathering on the ground, real time data in very precise ways. For example, his first "goal was to measure the inclination of people to act as knaves [uncooperatively] or solid citizens [cooperatively] at the scale of the whole city." He developed the first phase with the public school system, who helped and his volunteer students to do a survey of public school children. They used the Developmental Assets Profile, which is designed to measure factors related to healthy development. After collecting and cleaning the data, they used Geographical Information System (GIS) tools to create a topological map of their data to lay over a flat map of Binghamton. The result was a landscape of hills and valleys that showed the geographical distribution of the data. They could now see the neighborhoods where the students who identified themselves as "solid citizens" clustered (the hills) and where the "knaves" clustered (the valleys). The next step in this phase would be to identify the social dynamics that produced these results. 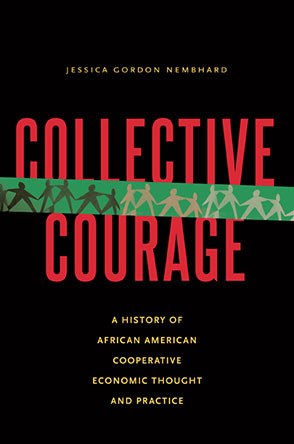 This book and Wilson's work should become a major resource for developing a fresh and highly functional framework for the future of grassroots organizing, solidarity economics, and collective action. that if the whole effort is going to have meaningful results, then it has to work at the grassroots where we live our daily lives. As such this is no easy read, but the ground he covers is interesting, even fascinating at times, and varied. It is written as a story full of many stories involving many people and animals. There are numerous character sketches as well as a variety of discussion about psychology, religion and spirituality, statistics, measurements, alternative education, and much more. The detail about the people and animals gives flesh and blood dimensions to the theory and experiments he discusses. "Evolutionary theory tells us unequivocally" that single organisms like you and your body are extremely cooperative groups. "You and I are groups of groups of groups. The lower-level elements of evolution (bacteria, cells, etc.) became more cooperative by higher level selection (animals, people, and social groups, etc.). Organisms (like you, me, and ceo's) are not defined by its physical boundaries (such as) skin, but by its organization which transcends its physical boundaries to become part of something larger than itself. "Human groups become 'bodies' or 'organisms' to the extent that they become internally cooperative," and this is literally true not metaphorical. Individual "autonomy is required for human group organisms to function. "Our future is bleak if we don't turn our groups into organisms." Having sung some pretty strong praises for this book, let me close with a critical note. Wilson seeks to ground thinking about culture change in the nature of the human body and its behavior. However, his and all of science's understanding of the human body and human behavior (culture) comes from the "without" of human life. The scientific method necessarily positions the observers in a place from which they look at humans behaving and bodies evolving. I have no problem with this. In fact, the more I learn about what scientists are learning about our behavior and our nature the more I value the power of this form of inquiry. What Wilson, Ostrom, et. al. are doing is simply wonderful. Scientific method, however, does not (or, at least, not yet) get to the "within" of human nature - that is, to our actual experience. Your behavior is visible to me, but not your experience. Wilson is right that "our future is bleak if we don't turn our groups into organisms." Turning a specific group into an organism, however, requires the folks inside developing the trust and transparency that is essential in human cooperation. We don't know how to do this in a way that is adequate to the challenges we are facing. If we are going to grow human cooperation to the depth and scale needed to make the world work well locally and globally, it has to work well face-to-face in real time. This is where conflicts and dilemmas arise that lead to the breakdown of cooperation at all levels of human life. Where those breakdowns occur is where the non-cooperators prevail. To meet this need requires a new kind of methodology--compassionate, experiential inquiry - and a new kind of field - human relations education. We have to find out how the cooperators themselves can become aware of what is happening in the "within" of the individuals and experiential field of the groups they are connected to as those conflicts and problems are happening. Learning how to do that requires us learning how to develop levels of compassion that can enable us to transcend our emotional boundaries so that we can somehow get into each other's experience through levels of trust that enable us to disclose our stuff to each other. Wilson doesn't address this issue, but then it doesn't seem to be on the radar screen of any social science in any coherent way. Not only that, as far as I can tell practitioners have not yet taken this on as a major, long term priority either. The permanent link to this article is http://geo.coop/node/679. 1. Born in the panhandle of Texas in 1942 of an Irish lass and a Mississippi gentleman...Grew up deeply Catholic in a bible belt with a nurse, a doctor and three brothers, on land as flat and rolling as the ocean, under an enormous vault of sky either full of sun or moon, and in the face of constant wind...Got the message at 16 that "the world doesn't work." 2. Entered a Kansas monastery in '63, left in '66; entered law school in NYC in fall of '67 and left in winter of '67; became an 'outside agitator at Columbia in April of '68 and discovered that the far left can be as top/down as the middle and right...deeply involved in group dynamics and community organizing in NYC '68-'73...bottomed out in Phoenix '73-'76. A member of the desegregation unit of Austin school system '76-'80. 3. Co-founded an intentional community in Staten Island, NY in '80, in part an experiential research center in democratic culture...still there 30 years later...immersed in the worker co-op and solidarity economy movements since 2007 with the Valley Alliance of Worker Co-operatives (New England), GEO, and the Community Economies Collective. His email address is michael@geo.coop. Michael Johnson (2011). Re-Thinking Social Change from the Ground-up.